Colonel J W Allen, 2nd Virginia Infantry or State Troops, was appointed colonel, Provisional Army of Virginia, at Harpers Ferry, Jefferson County, Virginia, on 1 May, 1861, and was assigned to command the 2nd Virginia Infantry, on 18 April, 1861. F Lackland was appointed lieutenant colonel, Provisional Army of Virginia, at Harpers Ferry, Jefferson County, Virginia, on 8 May, 1861, and died of pneumonia supervening upon organic disease of the heart at Fairfax Courthouse, Fairfax County, Virginia, on 5 September, 1861. Captain L Botts, 2nd Virginia Infantry, Company G, was appointed major, Provisional Army of Virginia, at Harpers Ferry, Jefferson County, Virginia, on 17 May, 1861, and was assigned to the 2nd Virginia Infantry, on 12 June, 1861. The company was accepted in state service at Charlestown, Jefferson County, Virginia, on 18 April, 1861, and was ordered to rendezvous at the Market House, Charlestown, Jefferson County, Virginia, between 1 and 2 PM the same day. The company arrived at Harpers Ferry, Jefferson County, Virginia, under the command of Colonel J W Allen, 2nd Virginia Infantry or State Troops, in the morning on 19 April, 1861, and was mustered in state service for one year by Captain L Botts, 2nd Virginia Infantry, Company G, on 13 May, 1861. The company was accepted in state service at Halltown, Jefferson County, Virginia, on 18 April, 1861, and was mustered in state service for one year at Harpers Ferry, Jefferson County, Virginia, by Captain L Botts, 2nd Virginia Infantry, Company G, on 11 May, 1861. The company was accepted in state service at Millwood, Clarke County, Virginia, on 18 April, 1861, and was ordered to Harpers Ferry, Jefferson County, Virginia, the same day. The company was mustered in state service for one year at Harpers Ferry, Jefferson County, Virginia, by Captain L Botts, 2nd Virginia Infantry, Company G, on 12 May, 1861. The company was accepted in state service at Martinsburg, Berkeley County, Virginia, on 18 April, 1861, and was ordered to Harpers Ferry, Jefferson County, Virginia, the same day. The company was mustered in state service for one year at Harpers Ferry, Jefferson County, Virginia, by Captain L Botts, 2nd Virginia Infantry, Company G, on 11 May, 1861. The company was accepted in state service at Hedgesville, Berkeley County, Virginia, on 19 April, 1861, and was ordered to Harpers Ferry, Jefferson County, Virginia, the same day. The company was mustered in state service for one year at Harpers Ferry, Jefferson County, Virginia, by Captain L Botts, 2nd Virginia Infantry, Company G, on 11 May, 1861. Company F Winchester Rifles: CAPT. W L CLARK, Jr. The company was accepted in state service at Winchester, Frederick County, Virginia, on 18 April, 1861, and was ordered to Harpers Ferry, Jefferson County, Virginia, the same day. The company was mustered in state service for one year at Harpers Ferry, Jefferson County, Virginia, by Captain L Botts, 2nd Virginia Infantry, Company G, on 11 May, 1861, and Captain W L Clark, Jr., was wounded at the first battle of Manassas on 21 July, 1861. The company was accepted in state service at Charlestown, Jefferson County, Virginia, under the command of Captain L Botts, on 18 April, 1861, and was mustered in state service for one year at Harpers Ferry, Jefferson County, Virginia, by Captain L Botts, 2nd Virginia Infantry, Company G, on 11 May, 1861. 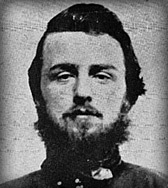 Captain L Botts, 2nd Virginia Infantry, Company G, was appointed major, Provisional Army of Virginia, at Harpers Ferry, Jefferson County, Virginia, on 17 May, 1861, and assigned to the 2nd Virginia Infantry, on 12 June, 1861. First Lieutenant E L Moore, 2nd Virginia Infantry, Company G, was appointed captain, 2nd Virginia Infantry, Company G, on 16 June, 1861. The company was accepted in state service at Duffields, Jefferson County, Virginia, on 18 April, 1861, and was mustered in state service for one year at Harpers Ferry, Jefferson County, Virginia, by Captain L Botts, 2nd Virginia Infantry, Company G, on 12 May, 1861. The company was accepted in state service at Berryville, Clarke County, Virginia, on 18 April, 1861, and was ordered to Harpers Ferry, Jefferson County, Virginia, at 1 AM on 19 April, 1861. The company was mustered in state service for one year at the school house on the Hagerstown Road by Captain L Botts, 2nd Virginia Infantry, Company G, on 13 May, 1861. The company was accepted in state service at Harpers Ferry, Jefferson County, Virginia, on 20 April, 1861, and was mustered in state service for one year by Captain L Botts, 2nd Virginia Infantry, Company G, on 12 May, 1861. "The troops at harper's Ferry were composed of the Staunton Artillery and West Augusta Guards, Albemarle Rifles, the Monticello Guards, the Southern Guards, the Sons of Liberty from the University, Scott's and Parran's companies from Gordonsville and Barboursville, a company from Louisa, the Orange Montpelier Guards, two Culpeper Rifle companies, the Winchester Continentals, the Winchester Rifles, a Charlestown company and a portion of the Fauquier Cavalry." "On Saturday afternoon last, at Harper's Ferry, flags were presented to the 'Jefferson Guards' and 'Botts' Greys,' by the Ladies of charlestown." "I returned form Camp Lee, in Berkeley county, within nine miles of the Pennsylvania line, and opposite Williamsport, Md.,) at a late hour yesterday evening. I had the pleasure of passing the first Sabbath of camp life, enjoyed by our noble regiment, in their company. Colonel Allen and Lieut. Colonel Luckland, I could almost say, are idolized by our boys, were it not that the devotions of that day, paid to the Most High, showed that there is One honored in their heart of hearts with an intensity of fervor still more ardent than their patriotism." "The Confederate camp, opposite this place, has fallen back from the Potomac about four miles, to Falling Waters. The church at Falling Waters has been occupied as a hospital. On Monday about two hundred Virginia troops reached Little Georgetown, seven miles above Williamsport, and have encamped there, using the church as barracks." The diary of Michael Reid Hanger, Rockbridge Rifles, Company H, 4th and 5th Virginia Infantry, 18 April-30 October, 1861, edited by Robert J Driver, Jr.
"Owing to some accident on the road, a part of the first brigade, under General T J Jackson, did not reach Manassas until early on Sunday morning, 21st. Captain Colston arrived on the field about sunrise on Sunday morning with but twelve men. He had been deserted during the first night's march by his first and second lieutenants, and their example had been followed by a number of the privates of the company. Nothing daunted, Captain Colston went into battle, leading those twelve brave, true hearts, and there gained that reputation for intrepid daring and courage which he so well sustained ever afterwards." The 2nd Virginia Infantry was stationed at Harpers Ferry, Jefferson County, Virginia, on 13 May, 1861. Mustered for one year, Harpers Ferry, Jefferson County, Virginia, 11, 12, & 13 May, 1861: The 2nd Virginia Infantry, Companies B, D, E, F, and G, were mustered in state service for one year at Harpers Ferry, Jefferson County, Virginia, by Captain L Botts, 2nd Virginia Infantry, Company G, on 11 May, 1861; Companies C, H, and K for one year on 12 May, 1861; and Companies A and I for one year on 13 May, 1861. Note: The Jefferson Guards, the Hamtramck Guards, the Botts Greys, the Letcher Riflemen, and the Floyd Guards were assigned to the 2nd Virginia State Troops, under the command of Colonel J W Allen, on 8 June, 1860. The Jefferson Guards, the Hamtramck Guards, the Nelson Guards or Millwood Rifles, the Winchester Rifles, the Botts Greys, and the Clarke Riflemen or Rifles were ordered to seize Harpers Ferry Arsenal and Armory, on Shenandoah and Potomac Streets, Harpers Ferry, Jefferson County, Virginia, on 17 April, 1861. Note: Colonel C A Crump, special aid to the Governor of Virginia J Letcher, was ordered to proceed by the Virginia Central Railroad to Harpers Ferry, Jefferson County, Virginia, on 17 April, 1861, and arrived at Charlestown, Jefferson County, Virginia, in the afternoon on 18 April, 1861. Charlestown to Halltown, Jefferson County, Virginia, Companies A & G, 18 April, 1861: The Jefferson Guards and the Botts Greys were ordered to rendezvous at Charlestown Courthouse, on George and Washington Streets, Charlestown, Jefferson County, Virginia, in the afternoon on 18 April, 1861, and were ordered to proceed by the Middleway, Charlestown & Harpers Ferry Turnpike to Halltown, Jefferson County, Virginia, under the command of Colonel J W Allen, 2nd Virginia State Troops, the same day. Note: Captain T Ashby, Fauquier Mountain Rangers, arrived at Charlestwon, Jefferson County, Virginia, in the afternoon on 18 April, 1861 (See the 7th Virginia Cavalry). Berryville, Clarke County, to Charlestown, Jefferson County, Virginia, Companies C & I, 18 April, 1861: The Clarke Riflemen or Rifles was ordered to proceed by the Berryville & Charleston Turnpike to Charlestown, Jefferson County, Virginia, at 1 AM on 18 April, 1861, and the Clarke Riflemen or Rifles and the Nelson Guards or Millwood Rifles arrived at Halltown, Jefferson County, Virginia, in the evening on the same day. Note: The Clarke Riflemen or Rifles and the Nelson Guards or Millwood Rifles were temporarily assigned to Nelson's Battalion Infantry, under the command of Senior Captain W N Nelson, Nelson Guards, at Harpers Ferry, Jefferson County, Virginia, on 19 April, 1861. Shepherdstown, Jefferson County, to Halltown, Jefferson County, Virginia, Company B, 18 April, 1861: The Hamtramck Guards arrived at Halltown, Jefferson County, Virginia, in the afternoon on 18 April, 1861. Note: The Shepherdstown Light Artillery was designated the Hamtramck Guards after the death of Captain J F Hamtramck, at Shepherdstown, Jefferson County, Virginia, on 21 April, 1858, and the Jefferson Guards, the Botts Greys, and the Hamtramck Guards were assigned to the Jefferson Battalion Infantry (250), at Halltown, Jefferson County, Virginia, on 18 April, 1861. Halltown to Harpers Ferry, Jefferson County, Virginia, Companies A, B, C, G, & I, 18-19 April, 1861: The Jefferson Guards, the Hamtramck Guards, the Botts Greys, the Clarke Riflemen or Rifles, and the Nelson Guards or Millwood Rifles, under the command of Colonel J W Allen, 2nd Virginia State Troops, were ordered to proceed by the Middleway, Charlestown & Harpers Ferry Turnpike to Harpers Ferry, Jefferson County, Virginia, at 9 PM on 18 April, 1861, and were accompanied by the Fauquier Mounted Rangers and the Black Horse Troop (See Munford's Squadron Cavalry). The Jefferson Guards, the Hamtramck Guards, the Botts Greys, the Clarke Riflemen or Rifles, and the Nelson Guards or Millwood Rifles arrived at Bolivar Heights, one and a half miles west of Harpers Ferry, Jefferson County, Virginia, at 10 PM on 18 April, 1861, and at Harpers Ferry, Jefferson County, Virginia, at 1 AM on 19 April, 1861. Note: The Fauquier Mountain Rangers and the Black Horse Troop, under the command of First Lieutenants B Randolph and R Ashby, respectively, arrived at Halltown, Jefferson County, Virginia, in the evening on 18 April, 1861, and a detachment of mounted service recruits (45), under the command of First Lieutenant R Jones, United States Mounted Riflemen, destroyed the Harpers Ferry Arsenal and Armory, on Shenandoah and Potomac Streets, Harpers Ferry, Jefferson County, Virginia, at 10 PM the same day (See the 2nd United States Artillery, Light Company M). Troops ordered to Harpers Ferry, Jefferson County, Virginia, Companies D, E, F, & H, 18-19 April, 1861: The Berkeley Border Guards, the Winchester Rifles, and the Letcher Riflemen were ordered to Harpers Ferry, Jefferson County, Virginia, on 18 April, 1861, and the Hedgesville Blues on 19 April, 1861. The Jefferson Guards, the Hamtramck Guards, the Nelson Guards or Millwood Rifles, the Berkeley Border Guards, the Hedgesville Blues, the Winchester Rifles, the Botts Greys, the Letcher Riflemen, the Clarke Riflemen or Rifles, and the Floyd Guards were stationed at Harpers Ferry, Jefferson County, Virginia, under the command of Major General K Harper, Fifth Division, Virginia Militia, on 23 April, 1861. Note: The 2nd Virginia State Troops was reorganised as the 2nd Virginia Infantry between 11 and 13 May, 1861, and the 2nd Virginia Infantry, Company I, was assigned to guard duty at the schoolhouse on the road between Harpers Ferry and Shepherdstown, two miles southwest of Shepherdstown, Jefferson County, Virginia, on 13 May, 1861. Harpers Ferry to Shepherdstown & Kearneysville, Jefferson County, Virginia, 13 May, 1861: The 2nd Virginia Infantry was ordered to Shepherdstown, Jefferson County, Virginia, under the command of Colonel T J Jackson, Provisional Army of Virginia, in the afternoon on 13 May, 1861, and to Kearneysville, Jefferson County, Virginia, in the evening the same day. Note: Colonel T J Jackson, Provisional army of Virginia, arrived at Harpers Ferry, Jefferson County, Virginia, in the afternoon on 29 April, 1861, and was assigned to command the troops stationed in and around Harpers Ferry, Jefferson County, Virginia, by General Orders No.23, Division Headquarters, Harpers Ferry, Jefferson County, Virginia, on 30 April, 1861. Kearneysville to Harpers Ferry, Jefferson County, Virginia, 14 May, 1861: The 2nd Virginia Infantry was ordered to proceed by the Baltimore & Ohio Railroad to Harpers Ferry, Jefferson County, Virginia, in the morning on 14 May, 1861. Harpers Ferry, Jefferson County, Virginia, to Lemon's Ferry, on the Potomac River, west of Williamsport, Washington County, Maryland, 20 May, 1861: The 2nd Virginia Infantry was ordered to Lemon's Ferry, on the Potomac River, west of Williamsport, Washington County, Maryland, on 20 May, 1861, and was accompanied by a section of the 1st Rockbridge Artillery, under the command of Captain W N Pendleton (See the 1st Rockbridge Artillery). Note: The 2nd Virginia Infantry was stationed at Camp Lee or Allen, Lemon's Ferry, on the Potomac River, west of Williamsport, Washington County, Maryland, between 20 and 31 May, 1861, and two companies of the 2nd Virginia Infantry were assigned to picket duty at Lemon's Ferry, on the Potomac River, west of Williamsport, Washington County, Maryland, between 24 May and 1 June, 1861. Lemon's Ferry, on the Potomac River, west of Williamsport, Washington County, Maryland, to Falling Waters, Berkeley County, Virginia, 31 May-1 June, 1861: Eight companies of the 2nd Virginia Infantry were ordered to proceed by the Martinsburg & Williamsport Turnpike to Falling Waters, Berkeley County, Virginia, on 31 May, 1861, and arrived at Camp Johnston, Falling Waters, Berkeley County, Virginia, in the morning on 1 June, 1861. Two companies of the 2nd Virginia Infantry stationed at Lemon's Ferry, on the Potomac River, west of Williamsport, Washington County, Maryland, on 31 May, 1861, were ordered to Falling Waters, Berkeley County, Virginia, at 12 AM on 1 June, 1861. Note: A section of the 1st Rockbridge Artillery, under the command of Captain W N Pendleton, was stationed at Camp Johnston, Falling Waters, Berkeley County, Virginia, on 31 May, 1861, and the 1st Virginia Cavalry, Company E, at Lemon's Ferry, on the Potomac River, west of Williamsport, Washington County, Maryland, in the morning on 1 June, 1861 (See the 1st Virginia Cavalry). Falling Waters, Berkeley County, to Martinsburg, Berkeley County, Virginia, Companies D & I, 2 June, 1861: The 2nd Virginia Infantry, Companies D and I, were ordered to Martinsburg, Berkeley County, Virginia, on 2 June, 1861, were accompanied by the Wise Artillery (See the Wise Artillery). Note: The 2nd Virginia Infantry, Company I, was stationed at the Grantham Hotel, on King Street, Martinsburg, Berkeley County, Virginia, between 2 and 7 June, 1861, and Company D at Martinsburg, Berkeley County, Virginia, on 5 June, 1861. Falling Waters, Berkeley County, to Bolivar Heights, one & a half miles west of Harpers Ferry, Jefferson County, Virginia, 7-8 June, 1861: The 2nd Virginia Infantry was ordered to Harpers Ferry, Jefferson County, Virginia, in the evening on 7 June, 1861, and arrived by the Baltimore & Ohio Railroad at Camp Jackson, on Bolivar Heights, one and a half miles west of Harpers Ferry, Jefferson County, Virginia, on 8 June, 1861. Note: The 2nd Virginia Infantry was stationed at Martinsburg, Berkeley County, Virginia, in the evening on 7 June, 1861. General Orders No.25, Headquarters, Virginia Forces, Richmond, Henrico County, Virginia, 8 June, 1861: The 2nd Virginia Infantry was assigned to the Confederate States by General Orders No.25, Headquarters, Virginia Forces, Richmond, Henrico County, Virginia, on 8 June, 1861, and was accepted in Confederate service on 1 July, 1861. Camp Jackson, Bolivar Heights, one & a half miles west of Harpers Ferry, to Shepherdstown, Jefferson County, Virginia, 13-14 June, 1861: The 2nd Virginia Infantry was ordered to Shepherdstown, Jefferson County, Virginia, in the evening on 13 June, 1861, and arrived at 11 PM the same day. Shepherdstown to Charlestown, Jefferson County, Virginia, 14 June, 1861: The 2nd Virginia Infantry arrived at Charlestown, Jefferson County, Virginia, in the evening on 14 June, 1861. Note: The 2nd Virginia Infantry, Company B, destroyed the covered bridge on the Potomac River, between Shepherdstown, Jefferson County, Virginia, and Sharpsburg, Washington County, Maryland, at 2 AM on 14 June, 1861. Charlestown, Jefferson County, Virginia, to Berryville & Charleston Turnpike, on the North or South Fork of Bull Skin Run, three or four miles west of Charlestown, Jefferson County, Virginia, 15 June, 1861: The 2nd Virginia Infantry was ordered to Winchester, Frederick County, Virginia, in the afternoon on 15 June, 1861, and arrived at Camp Whiting, on the Berryville & Charleston Turnpike, on the North or South Fork of Bull Skin Run, three or four miles west of Charlestown, Jefferson County, Virginia, in the evening the same day. Camp Whiting, on the Berryville & Charleston Turnpike, on the North or South Fork of Bull Skin Run, three or four miles west of Charlestown, Jefferson County, Virginia, to Bunker Hill, Berkeley County, Virginia, 16 June, 1861: The 2nd Virginia Infantry was ordered to Mill Creek, a quarter of a mile north of Bunker Hill, Berkeley County, Virginia, at 9 AM on 16 June, 1861, and arrived at Mill Creek, a quarter of a mile north of Bunker Hill, via Smithfield or Middleway, Berkeley County, Virginia, in the evening the same day. Note: The 2nd Virginia Infantry was assigned to the First Brigade, Army of the Shenandoah, under the command of Brigadier General T J Jackson, Confederate States Army, at Mill Creek, a quarter of a mile north of Bunker Hill, via Smithfield or Middleway, Berkeley County, Virginia,on 16 June, 1861. Mill Creek, a quarter of a mile north of Bunker Hill, Berkeley County, to Stephenson's Station, on the Winchester & Potomac Railroad, four miles northeast of Frederick County, Virginia, 17 June, 1861: The 2nd Virginia Infantry was ordered to proceed by the Martinsburg Turnpike to Winchester, Frederick County, Virginia, at 2 PM on 17 June, 1861, and and arrived at Stephenson's Station, on the Winchester & Potomac Railroad, four miles northeast of Winchester, Frederick County, Virginia, in the evening the same day. Stephenson's Station, on the Winchester & Potomac Railroad, four miles northeast of Winchester, to the Shenandoah Valley Agricultural Society Fairgrounds, one mile northwest of Winchester, Frederick County, Virginia, 18 June, 1861: The 2nd Virginia Infantry arrived at Camp Johnston, Shenandoah Valley Agricultural Society Fairgrounds, one mile northwest of Winchester, Frederick County, Virginia, in the evening on 18 June, 1861. Camp Johnston, Shenandoah Valley Agricultural Society Fairgrounds, one mile northwest of Winchester, Frederick County, to Martinsburg, Berkeley County, Virginia, 19-20 June, 1861: The 2nd Virginia Infantry was ordered to proceed by the Martinsburg Turnpike to Martinsburg, Berkeley County, Virginia, in the afternoon on 19 June, 1861, and arrived at Darkesville, Berkeley County, Virginia, at 11 PM same day. The regiment was ordered to Martinsburg, Berkeley County, Virginia, in the morning on 20 June, 1861. Note: The 2nd Virginia Infantry was ordered to destroy the rolling stock of the Baltimore & Ohio Railroad at Martinsburg, Berkeley County, Virginia, on 20 June, 1861, and was stationed in the vicinity of Martinsburg, Berkeley County, Virginia, on 21 June, 1861. The 2nd Virginia Infantry, Company D, was stationed at Camp Myers, on Opequon Creek, three miles east of Martinsburg, Berkeley County, Virginia, on 20 June, 1861. Camp Myers, on Opequon Creek, three miles east of Martinsburg, to Four Mile Woods or Myer's Orchard, east of the Martinsburg & Williamsport Turnpike, two & a half miles south of Hainesville, Berkeley County, Virginia, 21 June, 1861: The 27th Virginia Infantry was ordered to proceed by the Martinsburg & Williamsport Turnpike to Hainesville, Berkeley County, Virginia, at 3 PM on 21 June, 1861, and arrived at Camp Stephens, Four Mile Woods or Myer's Orchard, east of the Martinsburg & Williamsport Turnpike, two and a half miles south of Hainesville, Berkeley County, Virginia, the same day. Note: The 2nd Virginia Infantry was stationed at Camp Stephens, Four Mile Woods or Myer's Orchard, east of the Martinsburg & Williamsport Turnpike, two and a half miles south of Hainesville, Berkeley County, Virginia, on 30 June, 1861. Skirmish between W Hills & W Port(a)erfield's Farms, west of the Martinsburg & Williamsport Turnpike, one & a half miles southwest of Falling Waters, Berkeley County, Virginia, 2 July, 1861: The 2nd Virginia Infantry was ordered to support the 5th Virginia Infantry and the 1st Rockbridge Artillery on the Martinsburg & Williamsport Turnpike, in a vicinity of Hainesville, Berkeley County, Virginia, during the skirmish between W Hills and W Port(a)erfield's Farms, west of the Martinsburg & Williamsport Turnpike, one and a half miles southwest of Falling Waters, Berkeley County, Virginia, at 9 AM on 2 July, 1861. Camp Stephens, Four Mile Woods or Myer's Orchard, east of the Martinsburg & Williamsport Turnpike, two & a half miles south of Hainesville, to Darkesville, Berkeley County, Virginia, 2-3 July, 1861: The 2nd Virginia Infantry arrived at Snodgrass or Big Spring, on the Martinsburg Turnpike, one and a half miles south of Martinsburg, Berkeley County, Virginia, in the evening on 2 July, 1861, and was ordered to Darkesville, Berkeley County, Virginia, in the morning on 3 July, 1861. Darkesville, Berkeley County, to Stephenson's Station, on the Winchester & Potomac Railroad, four miles northeast of Winchester, Frederick County, Virginia, 7-8 July, 1861: The 2nd Virginia Infantry was ordered to Winchester, Frederick County, Virginia, at 9 AM on 7 July, 1861, and arrived at Camp Carter, Stephenson's Station, on the Winchester & Potomac Railroad, four miles northeast of Winchester, Frederick County, via Bunker Hill, Berkeley County, Virginia, in the afternoon on 8 July, 1861. Note: The 2nd Virginia Infantry was stationed five miles north of Winchester, Frederick County, Virginia, in the evening on 7 July, 1861. Stephenson's Station, on the Winchester & Potomac Railroad, four miles northeast of Winchester, to the Shenandoah Valley Agricultural Society Fairgrounds, one mile northwest of Winchester, Frederick County, Virginia, 10 July, 1861: The 2nd Virginia Infantry was ordered to Winchester, Frederick County, Virginia, at 7 AM on 10 July, 1861, and arrived at Camp Johnston, Shenandoah Valley Agricultural Society Fairgrounds, one mile northwest of Winchester, Frederick County, Virginia, at 12 AM the same day. The 2nd Virginia Infantry was ordered to Manassas Junction, Prince William County, Virginia, by Special Orders No.1, Headquarters, Army of the Shenandoah, Winchester, Frederick County, Virginia, at 1 AM on 18 July, 1861, dated 17 July, 1861. Camp Johnston, Shenandoah Valley Agricultural Society Fairgrounds, one mile northwest of Winchester, Frederick County, to Piedmont Station, Fauquier County, Virginia, 18-19 July, 1861: The 2nd Virginia Infantry was ordered to proceed by the Millwood Turnpike to Piedmont Station, Fauquier County, Virginia, at 12 PM on 18 July, 1861, and arrived at Berry's Ferry, on the Shenandoah River, three and a half miles southeast of Millwood, Clarke County, Virginia, at 9 PM the same day. The regiment arrived at Paris, Fauquier County, Virginia, via Ashby's Gap at 1 AM on 19 July, 1861, and was ordered to Piedmont Station, Fauquier County, Virginia, at 3 AM same day. The 2nd Virginia Infantry arrived at Piedmont Station, Fauquier County, Virginia, at 6 AM on 19 July, 1861. Piedmont Station, Fauquier County, to Manassas Junction, Prince William County, Virginia, 19 July, 1861: The 2nd Virginia Infantry was ordered to proceed by the Manassas Gap Railroad to Manassas Junction, Prince William County, Virginia, at 9 AM on 19 July, 1861, and arrived at Camp Pickens, Manassas Junction, Prince William County, Virginia, at 4 PM the same day. Camp Pickens, Manassas Junction, Prince William County, to Blackburn's & Mitchell's Fords, on the Bull Run River,19 & 20 July, 1861: The 2nd Virginia Infantry was ordered to the Bull Run River in the evening on 19 July, 1861, and to the rear between Blackburn's and Mitchell's Fords, on the Bull Run River, in the morning on 20 July, 1861. Note: The 2nd Virginia Infantry was stationed at the rear between Blackburn's and Mitchell's Fords, on the Bull Run River, as support to the First Brigade, Army of the Potomac, under the command of Brigadier General M L Bonham, Confederate States Army, on 21 July, 1861. Desertions of 2nd Virginia Infantry, Company D, 19 July, 1861: A detachment of the 2nd Virginia Infantry, Company D, under the command of Captain R T Colston, deserted between Winchester, Frederick County, and Piedmont Station, Fauquier County, Virginia, on 19 July, 1861, and a detachment (12) were engaged during the first battle of Manassas on 21 July, 1861. After the first battle of Manassas the 2nd Virginia Infantry was ordered to the rear between Blackburn's and Mitchell's Fords, on the Bull Run River, in the evening on 21 July, 1861. Rear between Blackburn's & Mitchell's Fords, on the Bull Run River, to Flat Run, three miles northwest of Manassas Junction, Prince William County, Virginia, 27 July, 1861: The 2nd Virginia Infantry arrived at Camp Maggot, on Flat Run, three miles northwest of Manassas Junction, Prince William County, Virginia, on 27 July, 1861. Camp Maggott, on Flat Run, three miles northwest of Manassas Junction, Prince William County, to Centreville, Fairfax County, Virginia, 2 August, 1861: The 2nd Virginia Infantry arrived at Camp Harman, one mile east of Centreville, Fairfax County, Virginia, on 2 August, 1861. Note: The 2nd Virginia Infantry was stationed at Camp Harman, one mile east of Centreville, Fairfax County, Virginia, on 31 August, 1861. Reorganised at Conrad's Store, on Elk Run Creek, Rockingham County, Virginia, 23 April, 1862: The 2nd Virginia Infantry was reorganised at Conrad's Store, on Elk Run Creek, Rockingham County, Virginia, on 23 April, 1862. Surrendered at Appomattox Courthouse, Appomattox County, Virginia, 9 April, 1865: The 2nd Virginia Infantry, under the command of Captain J J Jenkins, 2nd Virginia Infantry, Company H, surrendered at Appomattox Courthouse, Appomattox County, Virginia, on 9 April, 1865. The 2nd Virginia Infantry was assigned to the First Brigade, Second Corps, Army of the Shenandoah, under the command of Brigadier General T J Jackson, on 25 September, 1861.